Cleveland - White Girl Bleed a Lot, Knockout Game, black on white crime. I’m 27 years old, born and raised in and around the east side of Cleveland. I have to thank you for the attention you bring to things that are seen by few and reported by a fraction of that. I was born and raised in Collinwood, the most northeast neighborhood in Cleveland, my parents endured riots in school as it was integrated in the early 70s and I was sent to school in the suburbs where I live now. My wife is born and raised in this suburb (Wickliffe) and as new parents we are adamant of moving 40 miles east in time to send our son to school in 5 yrs. It is openly discussed among the older generations, how Collinwood used to be so nice and neighborly, how Euclid and Wickliffe were the suburbs you aspired to move to, signifying “you made it” and how sad and disgusting it is now that you can no longer feasibly raise a family here, only one generation later!! I was born in 1990, the first census that showed Cleveland being majority black, granted we were on the whitest eastside neighborhood, I since learned how much my parents fretted over what to do to get us out of there sooner than later, despite me being the 3rd generation born there, it wasn’t safe or practical anymore. Now, in the suburbs everyone moved to, it isn’t safe or practical anymore. On a street that used to inspire envy, I deal with an abandoned house on both sides, hillbilly’s beyond that, selling drugs doing drugs and carrying on all night as we try to soothe a 3 month old. For the first time, I am glad my father has been gone for 7 years, if he saw this it would have killed him anyway, and I feel sad that my grandmother is a prisoner in the house she bought 40 years ago after a lifetime of hard work. Im sure she never expected police to chase suspects thru her yard when her and my grandfather bought the house to leave Cleveland. I am sure you heard of the debacle that occurred a few months ago at the IX indoor Amusement Park in Cleveland where a riot broke out. I have treasured memories of going there as a kid and couldn’t wait to take my son in a few years, but I’m sure it won’t last that long after 150 “teens” fought. Terrorizing families and requiring cops from 10+ cities and state police to sort out. Beachwood Mall is a very high class mall in the east suburbs, I have never gone as an adult, because I can’t afford anything from the stores there. Places like nordstroms, saks, sharper image etc. Well certain teenagers have no problem taking the bus and having riots, frenzies and whatever else, there was a stretch over the winter where there were multiple carjackings, purse snatchings, shootings and assaults in the parking lot. No one was arrested. I know I have rambled, there are a million more things to say, examples the news wont say and personal anecdotes. But I enjoy your reporting on these matters and am beyond fed up with where I am, and what I must consider before picking family activities. That’s all for now sir, keep up the great work. So, I quit living in the neighborhood my family called home for good in 2013, great grandparents moved in in 1932. I couldn’t live there anymore after black gang members kicked my door in and shot at me and my guest (thank god he had a concealed carry permit) because I was the last young white in the area and I worked to make money. My parents dealt cards at Monte Carlo nights for festivals when I was young… E.185th festival, Euclid Festival, Waterloo Festival, holy redeemer, St. Jerome, St. Roberts, Shoregate, Eastlake, St. Williams, guess why none of them have been open for at least 15 years? Back then the boss would give my brother and I an unlimited ride pass and we would wander around all day while our parents worked. Hard to believe in hindsight, and I’m still young! 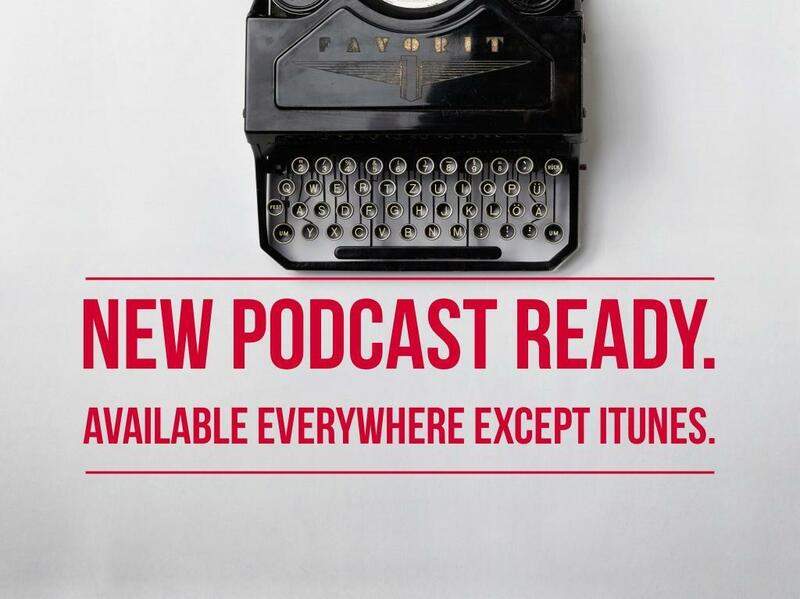 Euclid Mall, Richmond Mall, Randall Park Mall…. built by Eddie Debartolo, made his fortune there before he bought the 49ers. I have the vaguest memories of going to those places before it wasn’t safe, they are all since long closed. Valley view cinemas. Largest cineplex in the region, every few months on cue, the shine’s get a bug up there *ss. Look up all these places if you haven’t, you will find corroborating evidence my friend. A black cop pulled me over in the suburbs one time a few years ago, he searched my car and the only thing he found was a tire iron between my bench seats, he asked why I kept it there, I said with all due respect I spend a lot of time in Collinwood. He said carry on, that’s a helluva good reason! My nephews live way out in Amish Country, they are 8 and 10, last year I asked what they knew about Adams and Jefferson, they were dumbfounded. I asked what they knew about Obama and they rattled off a litany of his wonderworks on this racist country. Tower City, used to be a full scale high end mall downtown, now has a policy of no unaccompanied minors, even though all the high-end retailers left by now, it’s still racist. Frank Jackson is running for mayor again, he’s got a black dad and Italian mom, You can guess what he identifies as, but he goes to little Italy for every big fundraiser. Once again the list goes on friend. I will be happy to be your Cleveland correspondent if you don’t have one. My wife urges me to leave it all behind and never go back, but she didn’t take her first breath there, she didn’t grow up there and work for her family business there. It’s easy to turn your back forever on something you never knew, for me it is a little more difficult. Black violence against police: Relentless. Encouraged. Sacramento. Baltimore. Cleveland. Black mob threatens cops. Again. This time in Lorain near Cleveland. Ask a cop how often this happens. Craziest story of black on white crime ever? Maybe. I see a lot of crazy stories. And when I saw this story from Cleveland, it made me think this was the craziest story I had ever seen. Cleveland: Black mob violence common. Hidden. We don’t do enough on Cleveland. If you don’t report it then the people in Cleveland will say it’s not happening. So let’s talk about a couple recent examples of black mob violence in Cleveland. 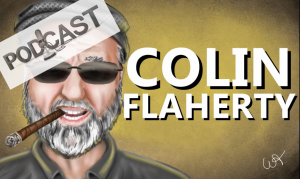 Colin Flaherty is an award winning reporter and author of the #1 best selling bookWhite Girl Bleed a Lot: The Return of Racial Violence to America and How the Media Ignore it. 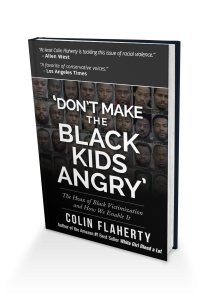 His new book, Don’t Make the Black Kids Angry: The hoax of black victimization and those who enable it, is available all the usual locations, including Amazon and wherever the finest books are sold. <ahref=”His%20new book is Don’t Make the Black Kids Angry: The hoax of black victimization and those who enable it, is available all the usual locations, including Amazon and wherever fine books are sold.”>Or just click here to get it at Amazon. Both books are about black mob violence, black on white crime and the Knockout Game — and how the media ignore, condone, deny, encourage and even lie about it. Large scale black mob violence at movie theaters. Cleveland and others. Cleveland: Large scale black mob violence at movie theater. The chief said he had not seen anything that big in Cleveland before at a movie theater. But it happens a lot around the rest of the country.